Data on homeless children and youth in California are now available on Kidsdata. Over a quarter million, or 4.4% of public school students, were recorded as homeless at some point during the 2015-2016 school year. Most homeless students stayed with friends or relatives because of loss of housing (85%), and the remainder were in a temporary shelter, motel, or were unsheltered. Recording homeless students during the school year is one way to measure homelessness. A second way to measure homelessness is with a point-in-time (PIT) count which is held nationwide on one night in January each year. In 2017, 1,649 youth who were under age 18 were found homeless without a parent or guardian. Most were unsheltered, meaning that they were found in a place not ordinarily used for sleeping. Federal agencies, researchers, and advocates agree that the homeless youth population remains largely hidden. Current methods to measure homelessness are presumed undercounts. However, the data that are available suggest this is a statewide issue. Earlier this month we released data on childhood poverty. Homelessness can be one of the tragic consequences of poverty. Data revealing homelessness among youth and research about the impact of homelessness can help raise awareness and drive solutions to ending homelessness among youth. Kidsdata shared how to access and use homeless data by legislative district at the Youth Empowerment Summit hosted by the California Coalition for Youth in Sacramento on April 16. The next day, participants met with state legislators in support of SB 918, the Homeless Youth Act of 2018. 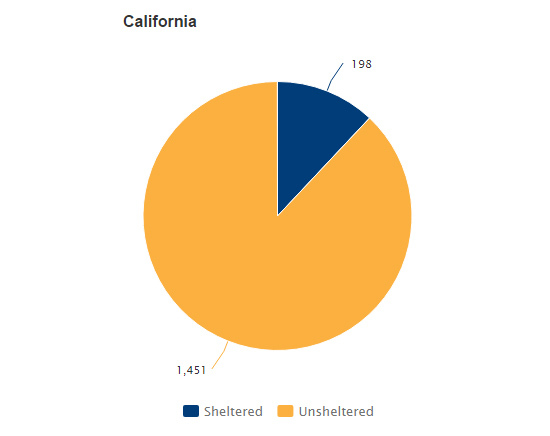 Estimates of homeless students, based on data from the California Department of Education’s Coordinated School Health and Safety Office, are available for your legislative district here. The California Homeless Youth Project uses data to enhance their “voices from the street” series. This entry was posted on Friday, April 20th, 2018 at 9:24 am. You can follow any responses to this entry through the RSS 2.0 feed. You can leave a response, or trackback from your own site.